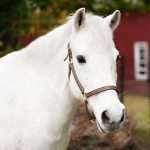 Description: Born in 1987, Blue is a grey gelding with a winning personality. He is a medium sized pony and his show name is “Midnight Blues”. Personality: Blue is a Troop favorite. Gentle and patient, he greets barn visitors with a friendly whinny and sweet expression. Blue is a wonderful teacher, though he doesn’t like it when riders pull too much on the reins. He specializes in teaching students to be smooth and accurate with their aids. History: Blue was a competitive Pony Hunter on the show circuit for many years. He was donated to NCMT to have an easier life and to fulfill very important responsibilities as a teacher.